The event promotion said, “Mr. 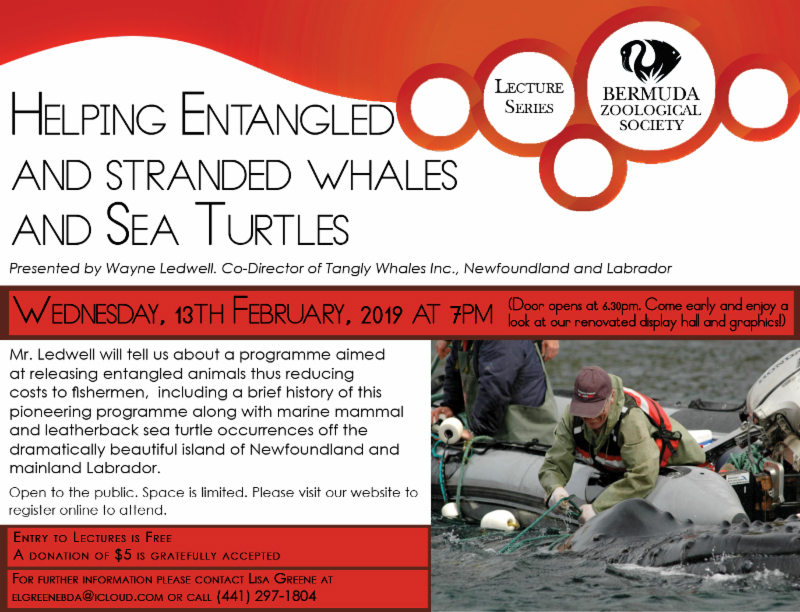 Ledwell will tell us about a programme aimed at releasing entangled animals thus reducing costs to fishermen, including a brief history of this pioneering programme along with marine mammal and leatherback sea turtle occurrences off the dramatically beautiful island of Newfoundland and mainland Labrador. “Entanglements of large whales in commercial fisheries in Newfoundland and Labrador, Canada, have been consistently recorded since 1979, as part of a program aimed at releasing captured animals and reducing costs to fishermen. “Whale Release and Strandings is a non-profit group that responds to whale, leatherback sea turtles and basking sharks entrapped in fishing gear, ice entrapped or stranded on the shoreline. “The group also conducts research projects and provides education outreach to fishers, community groups and schools on marine animal life in Newfoundland and Labrador waters. “Wayne Ledwell, and his partner Julie Huntington, have been managing this group since 2000. His presentation will include a brief history of this pioneering program along with marine mammal and leatherback sea turtle occurrences off the dramatically beautiful island of Newfoundland and mainland Labrador. “For further information please contact Lisa Greene at elgreenebda@icloud.com or call 297-1804.